I cannot help but notice how much more difficult writing has become with the increased dosage of Oxycontin/Oxynorm used to reduce my pain levels. It has been nine agonising months since I began to feel the pain in the right shoulder and arm. It seems that, at last, we are closer to finding the cause, and the solution, to the pain that has kept me away from the keyboard and the very people that brighten my sometimes dark days. I have missed you all and look forward to resuming regular entries. Reflecting on the period since my mastectomy in December 2005 I seem to be getting a clear picture. Shortly after my surgery Haydn and I found ourselves travelling frequently to Dubbo to spend time with my elderly Mother who was experiencing severe abdominal pain and was not at all well. Mum died several weeks prior to the accident that took the life of my youngest son in November 2006. In June 2007 I found myself with another breast lump. I was not surprised! Although I sought medical advice, and the lump was monitored, I now realise that I did not see a future for myself. My will to live was simply not 100%. Fortunately, with time, my body, mind and spirit has undergone enormous healing, and I am, once again, doing battle to give me back my life. Looking at my reports I see that I have had several CT scans and one bone scan over the past months. I am still unsure why nothing was done however, I believe we are now close to finding the solution that will soon see me pain free. Could it simply have been that I was not ready for the fight? In February my regular GP returned from an extended break. At the time of my consultation, I presented with pain in the arm and limited usage plus a loss of strength. There was also the problem of pins and needles in the three middle fingers I had been prescribed morphine in January by another doctor in the practice. My doctor recommended an MRI. Our Medicare system meant that he was unable to requisition it as it could only be done by a specialist. Firstly there would be a process of elimination. Thankfully, my condition is now been treated as urgent. Appointments have been moved and changed and my MRI was done Tuesday. Yesterday I returned to Dr Katekar to be told that there appears to be a local recurrence. The pictures are consistent with metastatic infiltration of the right thoracic outlet, including muscles and the nerves of the brachial plexus. Ouch! No wonder the pain is agonising. In simple language, it seems that there is active cancer in the nerves. I am to see my GP on Monday. Hopefully, he will have set up an appointment with an oncologist at the Mater Hospital (getting closer to that elusive cup of coffee Lisa.) Dr Katekar made it clear that he in not an oncologist but did suggest that I will possibly be given radiotherapy to reduce the size of the tumour and to kill the active cancer in the nerves. Bingo! The pain will then be reduced and so too, the need for morphine. It seems that a tremendous load has been lifted. I am encouraged by the scans which show there is still only one tumour. It has not increased in size although there is an abundance of fluid and swelling in that area. I am optimistic that, reducing the tumour size slightly, will allow me to co-operate fully with my body's own self-healing mechanisms as the radiotherapy does its work. Today I give thanks, knowing that this is a good outcome. Our prayers have been answered! I am grateful for your friendship and your loyalty and feel excited at the prospect of, once more, becoming a regular contributor and follower. We gain strength, and courage, and confidence by each experience in which we really stop to look fear in the face... we must do that which we think we cannot. Today became a day of reflection and contemplation as I began the wait for the appointment for the MRI knowing that it would determine the path ahead. Haydn and I went to the Maitland markets; we know that Autumn is the perfect time to plant. On our arrival home I walked into the garden and snapped a few pics for this post while Haydn got the ride on mower out. Even using the camera is difficult at this time. I pray that it is nothing more than the Carpal Tunnel that is causing the problem. Not having use of the three fingers on my right hand can be challenging. 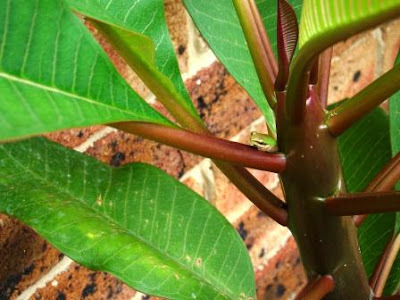 The small green tree frog has made a home on the leaf the frangipani. We were given two frangipani plants by Mick, a tenant in one of the industrial sheds in Haydn's complex. 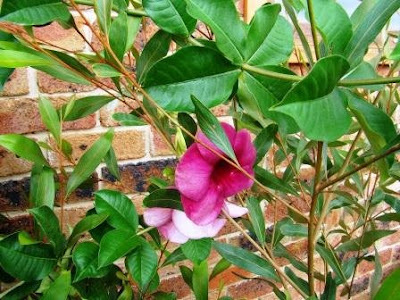 This Allamanda Cherry Ripe survived sheer neglect after the sale of our home in Charlestown. We lived in a colourbond at the factory for 18 months while waiting for the house at the farm to progress to the point it was habitable. The colour in this picture does not do it justice. 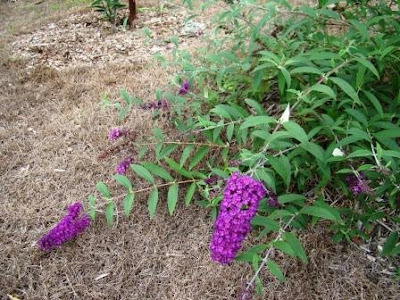 This magnificent magenta Buddleja davidii or Butterfly Bush attracts the most amazing butterflies to the garden for about 9 months of the year. This Euphorbia Diamond Frost was planted in November when we undertook the transformation of the bush garden in memory of Jeremy. 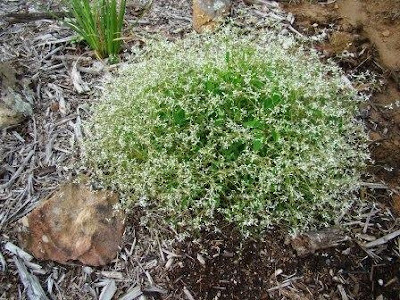 The flowers are like millions of tiny butterflies and it flowers all year round. 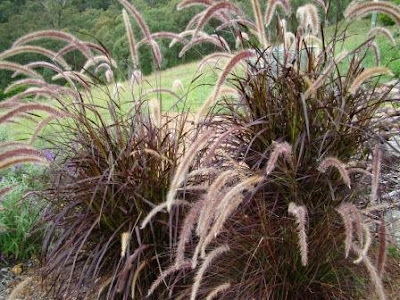 Purple Fountain grass surrounding the frog pond in the bush garden. 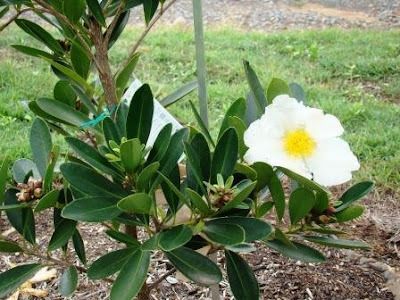 The magnificent flower of the Gordonia Axillaris. Love the delicate flower of the Grevillea Orange Marmalade. 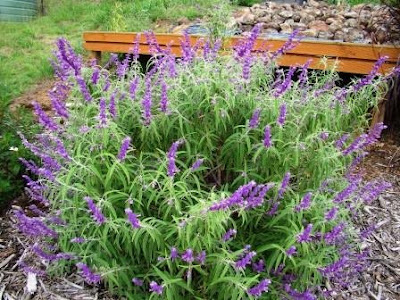 This lavender Butterfly Bush is in the bush garden and flowers almost all year round. 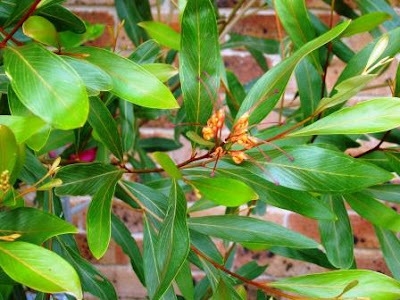 The plant was bought for $1 at the markets in Lakes Entrance when we went to Victoria for the butterfly Release on the first anniversary of Jeremy's accident. This is the lemon miniature Chinese Lantern bought also for $1 at the markets in Lakes Entrance. 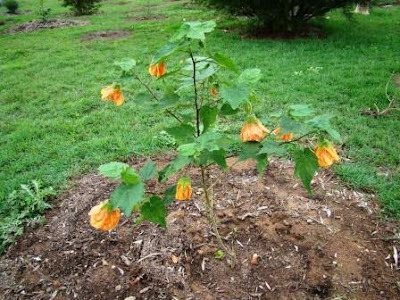 It has not stopped flowering. 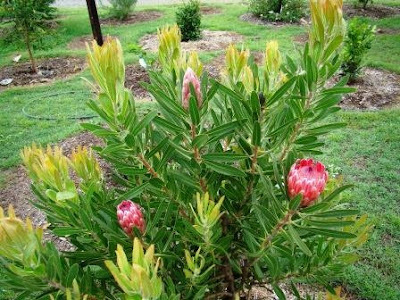 First flowers on my Protea Pink Ice. 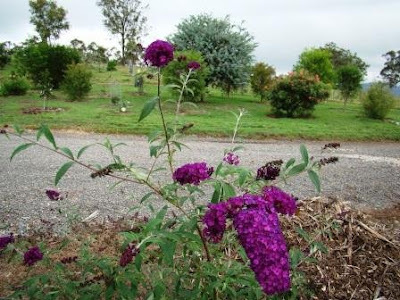 Once again, the colour of the flowers on this Butterfly Bush are so much so much prettier than the picture shows. 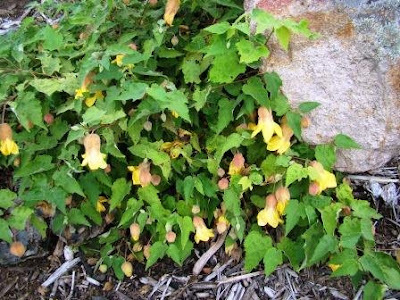 The intention of the garden is to provide a natural and safe habitat for birds, butterflies and animals. I certainly felt at peace with the world when I came indoors and decided that sharing it with you would bring even more joy. Wishing you all love, light and laughter. Is there light at the end of this tunnel? On Thursday of last week I sat in the office of my GP feeling worn out and tired. My spirits lifted when I learned that my doctor was doing a Letter of Referral to Dr Michael Katekar. Dr Katekar, a Consultant Neurologist, had me admitted to hospital in 1998 where it was determined that I had a mass abutting the right hand side of the pelvic wall. The mass was irritating the obturator nerve causing severe neuralgic pain. At one point I was taking over 150 mgs a day of oral morphine. Dr Desouza explained that he would fax the Referral to Dr Katekar who would determine the degree of urgency and have his receptionist phone me with appointment details. Silly me! I expected to hear from them immediately; I sat by the phone. On Monday morning, after yet another sleepless night, I felt the need to take some responsibility. I phoned Dr Katekar's surgery. My enquiry drew a blank although I did receive confirmation that my name was there. Patience needed here. On Wednesday evening I stood outside, taking in the beauty of the countryside, and the freshness of the air after 175 ml of rain which had bucketed down in just 48 hours. Enjoying the stillness, I smiled when I heard the call of the kookaburra, observing that the sound had come from the meter box beside the house. I immediately took my copy of Animal Dreaming to a quiet spot where I read what Scott Alexander King had to say about the symbolic and spiritual language of the Australian Kookaburra. The message is clear; time is right for me to take responsibility for my own healing, including the release of pent-up pain, confusion and resentment which could be very confronting. There is an alternative to this internal suffering. Kookaburra is calling for me to probe deeper than the superficial laughter, to awaken to my inner truth and the dawning of a new day. 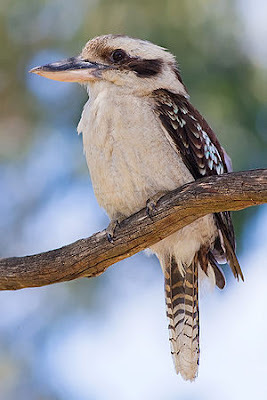 Kookaburra is Spirits way of restoring faith in my quest for personal healing. I was not at all surprised to find the following morning there was a phone call from Dr Katekar's office to say that an appointment had been made for 9.45am this morning, Friday 3 April. The nerve conduction study clearly showed the severe damage to the nerves in the wrist. Ah! Ah! Carpal Tunnel explains the pins and needles, loss of strength and problems with the three middle fingers on the right hand. And there's more. Dr Katekar then began sticking needles into my arm, turning the dial to increase the nerve stimulation. Help! I have been conditioned never to allow anyone to put needles into my lymphoedema arm post mastectomy. My paranoia now apparent as I began to breathe deeply, knowing that my priority is to find the reason for this pain that keeps me awake at nights, away from my friends and requiring regular morphine just to get out of bed each day. Dr Katekar quickly pointed out that there appeared to be another problem. The index and little finger on the right hand behaving differently to those on the left hand. He recommended an MRI of the cervical spine and brachial plexus, pointing out that he was obliged to tell me that there is possibly a recurrence of the breast cancer in the axillary region. At best, there could be a simple problem in the nexk. At worst, the lumps that have appeared above the original incision could be a recurrence. I acknowledged his comment understanding only too well that the journey continues. I phoned Hunter Imaging to make the appointment and learned that Dr Katekar had already made contact. He apparently explained that the test was a matter of urgency. Earliest available appointments were 6th and 7th May! The receptionist was delightful and said that they would look at rearranging some appointment to get me in ASAP. Once again, I am bemused to learn that the appointments are made for consecutive days as Medicare will not pay if they are done on the same day. No problem! Do we care that it is 180 km round trip for us to make our way to Cardiff and return which means Haydn giving up his days also as I do not drive while taking the 40 mg of Oxycontin night and morning.